One thing we learned on our recent trip to Music City is that there’s always a ton of free concerts going on in Nashville. 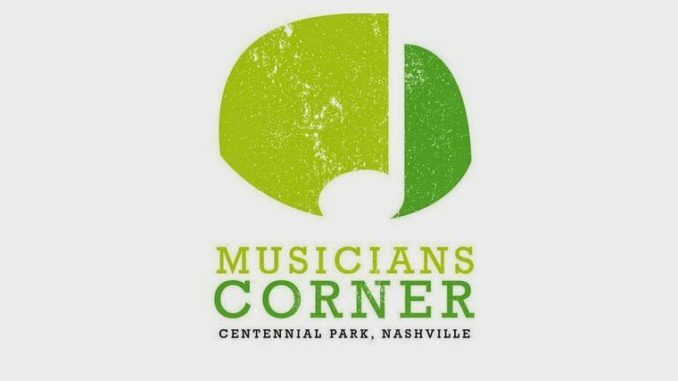 A popular ongoing festival is the weekly Musician’s Corner – now in their fifth year – held on weekends in the city’s Centennial Park. 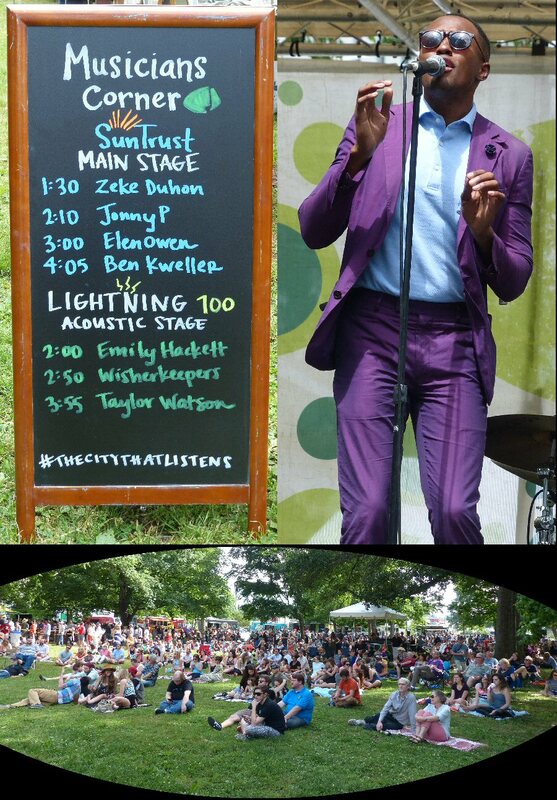 When we arrived on Saturday, May 23, 2015 we were excited to discover that the acclaimed indie roots rocker Ben Kweller would be headlining the day’s event that would also feature many of Nashville’s local favorites. 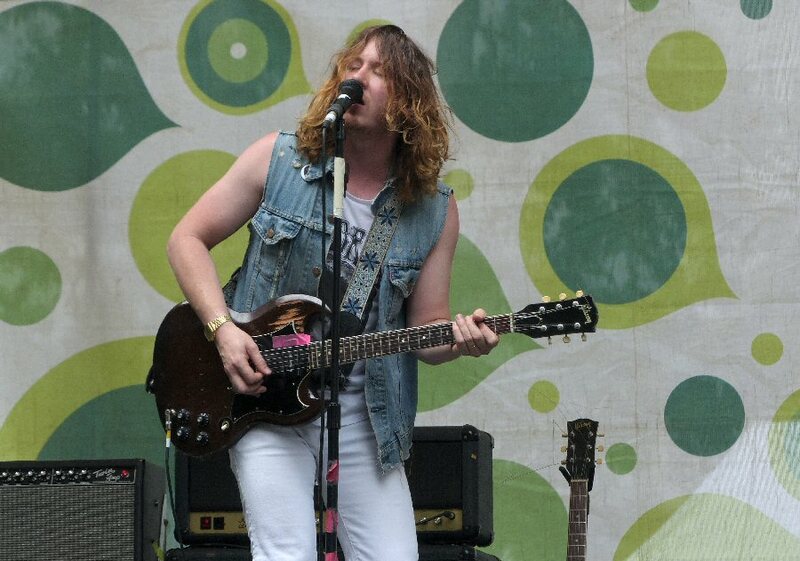 Ben Kweller rocks Music City during his recent headline slot at Musicians Corner. Kweller hit the stage on time just after 4 p.m. fronting a frenetic three-piece. His drummer was channeling famed stickman “Animal” as he was wearing a white buffalo skin head covering. Ben quickly got down to business opening with “Commerce, TX” that showcased spirited strumming and singing packaged with a decisively punk vibe. Kweller proved he was beyond classification as this Austin-based musician has been known to morph stylistically from one project to the next. Additional songs were more melodic and poppy but all were spiced up with Ben’s incendiary and expedient guitar breaks. Earlier, a local favorite Elonowen – featuring the pairing of husband and wife singer/songwriters Josh and Nicole Johnson – entertained with a quality set that bordered on the blues and featured some standout slide guitar. Their songs showcased strong blended vocals that stood out above the rock backing from the capable 5-piece. 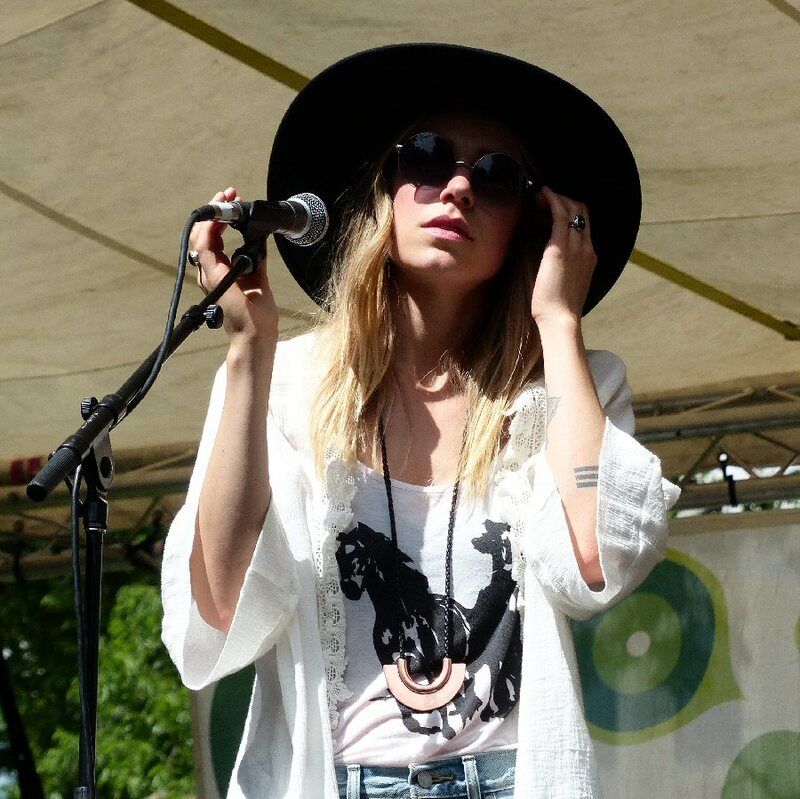 Nicole Johnson of Elonowen was sultry and stylish during her band’s engaging set. Elonowen described their music from the stage as mainly songs about their relationship together – the good and the bad. They moved into a number they said for them was a tad more “funky” than their usual fare before closing out with a cover from another act known for recording music about the inter-personal ties of their group, Fleetwood Mac. “Dreams” started out with a slow acoustic arrangement prior to hitting its stride and more familiar form. The band exited the stage to appreciative applause from the large crowd gathered on this lovely May day. New York’s Jonny P was a revelation. Originally hailing from New Rochelle this R&B singer has recently made Nashville his new town and together with his 7-piece combo he was putting his own scintillating stamp on the city. His set was chock full of groove and soul punctuated by powerful horns and professional keys. He reminded the audience that in these turbulent times he was proud to live “in a city of love” and asked the gathered “to keep love alive”. Near the site of the the Musicians Corner concert stage stands the Parthenon. This stately structure says “Welcome to the Athens of the South” and along with a gigantic statue of Athena together they are the centerpiece of Centennial Park in the city of Nashville, Tennessee. Both the building and statue are full-scale replicas of their counterparts in Athens, Greece. Centennial Park is a large urban green space located in the West End section of Music City. The grounds feature walking trails and Lake Watauge. New York’s Jonny P was making his presence known in his new town. The Parthenon serves as an art museum. Its permanent collection includes 63 paintings by 19th and 20th century American artists given to the museum by James. M. Cowan. There are also additional galleries for special exhibits. 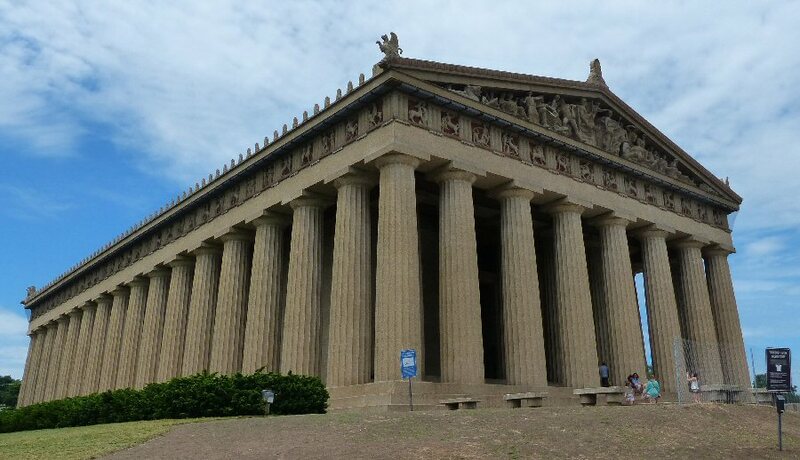 The Parthenon was built in honor of Tennessee’s Centennial Exposition that took place in 1897. It was originally designed to be a temporary display of classical architecture. Since the cost of demolishing it was prohibitive The Parthenon instead became a popular landmark in Centennial Park that still stands today. The most impressive exhibit in The Parthenon is on the second floor where the goddess of wisdom, prudent warfare and useful arts reins. Athena stands over 42 feet tall from the floor to the top of the center crest of her helmet. Even Nike the goddess of victory who stands on Athena’s right hand is over 6 feet. Both are gilded in gold with 8 pounds of 23.75 caret gold. The Elgin Casts are also on the second level. These casts were based on fragments from the Acropolis that were used by sculptures Leopold and Belle Kinney-Scholz to re-create the complete pediments on the Nashville building. The first floor of The Parthenon includes a history of the structure and park along with visiting exhibits. Their permanent collection has a fine assortment of landscapes presented in a number of mediums including oils. The Parthenon with Athena are alone worth the trip to Centennial Park but there is more to explore here. On weekends during the spring Musicians Corner hosts free (donations welcomed) concerts within the vicinity of The Parthenon. These events echo Nashville’s love of free music with a nod to its local breweries and eateries. The Parthenon is an impressive site dominating the Centennial Park landscape.